knowledge and sensibility in the handling of material that develops through time spent, and an appreciation of changing technologies over time. the projects that he has undertaken in India such as ‘Sculptures from a Land of Ants and Bees’, Delhi (2006) where Burton worked with bamboo and ladder workers – traditional craft workers whose skills are increasingly challenged by a burgeoning industry. In the UK it is Industry that is currently being challenged and sculptors such as Burton can suggest ways for us to think about this cycle of decline and regeneration through the objects that they make. time of making, and there is a real sense of physical connection’. Shelly Goldsmith also uses a layered process and knowledge of materiality in the handling of complex scientific processes, particularly human biology, in her investigations into worn garments. In ‘Outpourings on an English Landscape’ (2009) Goldsmith worked collaboratively with the Forensic Science Service to explore the parallels between ‘forensic methodology and the methodology of her practice’. – not only to traditional skills and processes (the textile media she employs), but also to a fundamental understanding of ourselves, our relationshipwith the world we inhabit, and the residues we leave behind. The everyday residues of another kind form the material with which artist Catherine Bertola constructs and creates installations, objects and drawings that respond to particular sites, collections and historic contexts. chalking numbers on a blackboard. ‘Starting at one, each number was drawn and rubbed out by hand then replaced by the next number in basic numerical sequence. The whole process is repeated until the number 840 is reached’. repetitious exercise holds the meditative and repairing element of the making process within it. embody something of their previous life: they hold memory. their making tangibly make present. The exhibition Process Works took place between January and October 2007. 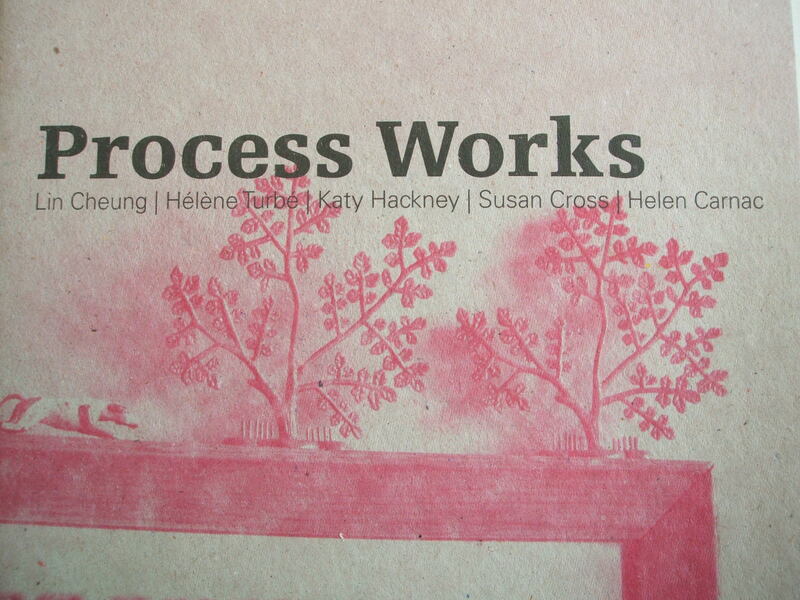 Process Works aimed to understand and explain the discreet languages of making and its specificity to individual practice. Examining this in the first instance through an exhibition and catalogue, with an invited written contribution in the form of essays and maker interviews by Paul Harper. The exhibition toured 3 venues; curatorial reaction to venue type and location was a central theme of the project. Artist talks were held at all venues and The University of Herts. exhibition was reviewed. (Mark Lewis; Process Works: An exploration of the creative inspiration and developmental work of five contemporary jewellers. Findings. June 2007. P7). How the act of making may be understood both inside and outside practice and whether the act is more understandable when we are able to encounter the process in whatever way? Process is rarely examined in exhibitions of made artefacts and yet making implies a process – a journey, an examining of thought, of meaning and a putting together of elements, materials and ideas. An important element was the positioning of Helen Carnac as maker/curator, this at once allowed the examination of curator and curated from the standpoint of one practice and the making of a comparative analysis of internal/external direction.